Matt was born in Peoria, IL in 1988. Matt graduated from Morton High School in 2007. He attended Olivet Nazarene University and received his Bachelor's degree in 2011. He graduated from Southern Illinois University Law School in 2014. Matt was admitted to the bar and joined the firm in 2014. 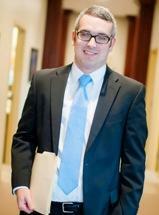 His practice is concentrated in plaintiff's personal injury and worker's compensation.